Pumpkin used in baked goods seems to be gaining in popularity. It is one of the most common flavors of Fall and gets used right through the Holidays. Most typically it gets made into pies and served as dessert, however I am seeing more and more recipes for pumpkin used in breads, muffins and scones. I love pumpkin in any form, I am also crazy about scones and as most of you know by now, crystalized ginger. So when this recipe with those three magic words as its title found its way into my house recently I was preheating the oven before I got to the end of the recipe. An absolutely lovely breakfast item they are full of flavor from the spices and dried fruit, and they also have a pleasant bite from the ginger bits that will get you going in the morning. They are extremely easy to mix together, bake up in a jiffy, and you can be enjoying them within an hour. They are wonderful warm from the oven, but also reheat nicely in the microwave. This is another recipe you might want to have handy for Thanksgiving morning. If you are having house guests, set out a basket of muffins and scones, hot coffee and juice and let your guests help themselves to breakfast. 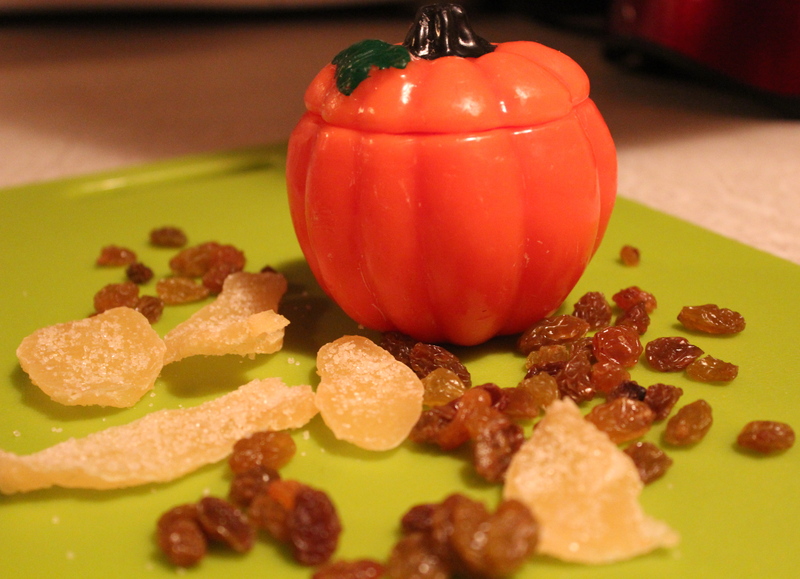 Essential ingredients: pumpkin, raisins, and crystalized ginger. 1. Preheat the oven to 375 degrees. 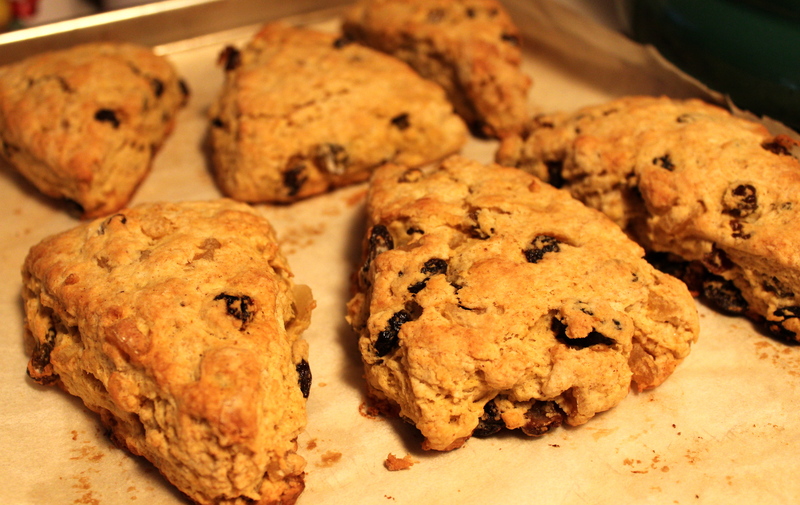 Line a baking sheet with parchment, or lightly grease a scone pan. 2. In a large mixing bowl, whisk together the flour, brown sugar, baking powder, salt and spices. Cut in the butter until it’s the size of peas. Stir in the raisins and ginger bits. 3. Stir the pumpkin, vanilla, and egg together and add to the dry mixture, mixing until the dough comes together. 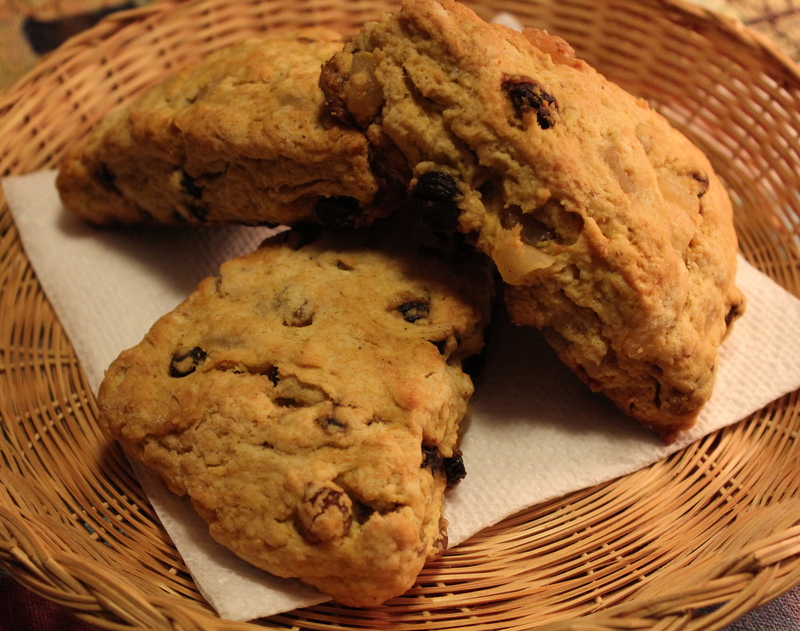 Pat the dough into a circle on the prepared baking sheet, or scoop into the wells of your scone pan. Fresh out of the oven, just waiting for YOU!